While some of you are living where the weather has been unseasonable, here in south Florida our springtime fishing started about a week ago. And our all day trip today was proof positive of this. Our 3 guests had but one day before heading to Bolivia. They are volunteering to help build churches in areas that cannot afford them. Certainly a noble cause and perhaps even lending to a fun, fish filled day. With the forecast of rain, we opted to catch our own bait. Chum and the usual areas were not providing so our trolling gear was deployed. It took maybe 20 minutes for our first bite and the action was near nonstop the rest of the day. First were the Kingfish in the reef area. Bites were coming one or two at a time. While our guests had never used this kind of tackle before, they adapted quickly and soon were beating Dom to the rod when a bite came. 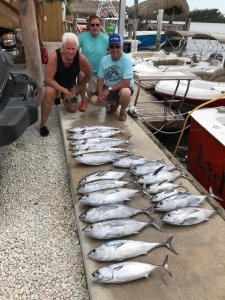 They were having so much fun, even after the 2 per person limit was reached, we continued catch and release for a while before venturing just a bit further off shore. The top picture is Dom holding a Yellowfin Tuna. 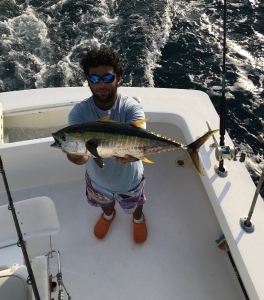 This small Tuna was schooling with the Blackfin Tuna. We had stumbled into Tuna Topia and some nice sized fish were biting. Yellowfin are rare in our area and we ended up with 2 along with a hoard of Blackfin. We took a break from this action to put the boys on something bigger. The Amberjacks cooperated nicely for this purpose and the guys enjoyed posing with their catches before releasing those back to the sea. Our troll home was still producing more Tuna but these were considerably smaller than the ones from earlier. We had plenty and were releasing them as we went until the time came to return to the dock. This is the kind of action you expect from springtime fishing. I look forward to fishing again today.